Now that the Oculus Rift is in the hands of developers and enthusiasts (read my extensive review of the Oculus Rift Oculus Rift Development Kit Review and Giveaway Oculus Rift Development Kit Review and Giveaway The Oculus Rift has finally arrived, and is making heads turn (literally) all over the gaming community. No longer are we confined to to peering through a flat window into the gaming worlds we love... Read More ), work on the consumer version is well underway. New games are being developed, existing games are being ported, and every day more people get to experience just how incredible the world of immersion virtual reality can be when done right. So we have the visual element of virtual reality gaming basically sorted, but what about controllers? If you have the ability to look all around you, suddenly the old mode of sitting in front of a keyboard and mouse just doesn’t work. Let’s take a look at some better control schemes for use with VR. The problem with a mouse and keyboard is obvious – you have the freedom to move your head around in VR, but if your hands are tied to a fixed point in front on you, it quickly becomes uncomfortable and ruins the illusion. Apart from which, the practicality of trying to locate a specific key when you can’t actually see the keyboard is laughable. The best solution we have at the moment are handheld controllers like the Xbox 360. This untethers you from the desk to some extent, but still leaves another problem – motion sickness. There are many different reasons most people experience some degree of motion sickness inside immersion virtual reality, but one of the main reasons is the brain-body disconnect. You press the W-key and your body lunges forward, even though your legs aren’t moving. It’s this disconnect between what your eyes are seeing and what the rest of your brain is experiencing which contributes to the feeling of motion sickness. This is obvious if you compare something like the Tuscany demo, with the RiftCoaster – you’ll likely get motion sickness faster when you’re simply walking around a serene Tuscany scene than when you’re riding a rollercoaster – perhaps contrary to what you would expect. Why? Because if you’re sat on a roller coaster, your brain expects to be flung around and moving forward at high speed. So in first person games, we need something more realistic. The first VR control enhancement is to create a realistic set of in-game hands or a physical gun which you can hold and wave around. The Razer Hydra, a PC motion controller which resembles a pair of Wii Nunchucks connected to an alien spaceship, uses magnetic induction to give accurate positional mapping of your hands to an in-game set of hands or a gun. I’ll have a full review (and we’ll be giving a set away) later next month, but for now check out this demo video from the upcoming game, The Gallery to get good overview of what it can do. As a Hydra owner, I promise you that it makes a world difference. Having a pair of virtual hands in the game – a physical embodiment – really adds to the level of immersion. Taking things a step further, Tactile Haptics recently showed prototype of a modified Hydra being used in combination with feedback motors – able to simulate a variety of tactile sensations, such as hacking with a sword or swinging a flail. They’re hoping to launch an immersion virtual reality KickStarter later this year. From start-up Virtuix comes the Omni, an omni-directional platform that gives freedom of movement through natural use of that powerful controller – your feet. And crucially, it’s affordable and of an appropriate size to fit in the home at just 1.2m across. 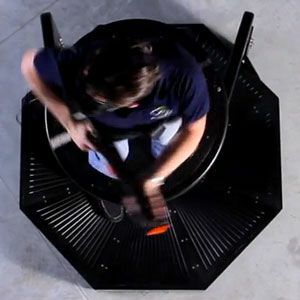 Omni-directional platforms is not a new idea with VR – more permanent installations can use a costly full-room treadmill type setup, such as the CyberWalk research project shown below. Obviously, these are completely impractical and out of the budget of most home users. However, the Omni has a unique approach. Instead of using a treadmill, it has a extremely low friction platform. When combined with a special pair of shoes and the special shape of the platform, allows the user to walk or run on the spot with a realistic gait (albeit with quite a lot of noise when running). The Omni launched on KickStarter last week and is already well on the way to being fully funded. With initial units priced at around $500 plus shipping, it’s set to become the next essential bit of kit for the VR gamer. Crucially, the Omni includes a support device to prevent the player falling over, and shoes which slot into the platform surface to avoid slipping. Although the prototype is using a Kinect for body tracking, the final version is set to include built-in tracking sensors. Have you had a chance to try out the Oculus Rift, and do you think the experience of immersion virtual reality would really be enhanced with the Virtuix Omni? Does it look impractical for the average gamer? Not as far as I know, but that would be a great project. We could use something like a pressurized ball on a low friction platform like above, and special shoes with high adherence. That would reduce the noise, the price of the sphere, and may be better for motion capture. It just seems less artificial to run inside of a sphere than on a static surface. Yes, It would require a wireless rift. But with protocols such as UDP, it is possible to create a low-latency transmitter. Maybe combined with Li-fi?